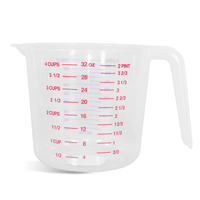 As a cup that can be used to mix soap making ingredients and pour directly in desired container/mold. Soap and Lotion Making tool. Fill with desired amount of product up to 8 cups (we recommend only filling up to 7 when Cold Process Soap Making to avoid the risk of dangerous spills). Mix product. Hold handle and pour from spout into mold/container. COMMENTS: I must admit the price gave me pause, but I went ahead and bought this and I'm so glad I did. It is beautiful and very high quality ! I "save" it for my other products and don't use it for soap making. I love that you can melt oils with it and then pour directly from it. Very convenient. Cleans like a breeze. The best piece of equipment I own. Don't hesitate to buy this. I would love to see this offered in other sizes. Thanks WSP ! Love it ! • Very high quality stainless steel. • Nothing except more sizes. COMMENTS: Never in my life have I been more excited to receive a pot, but this has everything I have been looking for!! I have been on the hunt for a good stainless steel pot I could make CP batches in, but everything fell short of my expectations... I felt like the Goldilocks of pots! Lol (ie: Too big, too small, flimsy handles, too expensive, etc, etc!). This one is juuust right! This is an incredibly well-made, sturdy pot of superior quality, and is going to save me sooo much time & cleanup!! Previously, I'd measure out & melt my oils & butters in a small crock pot, but because I didn't like the idea of adding lye to my crock pot, and since pouring directly from the crock pot to the mold was difficult anyway (due to the lip around the edge), I'd have to transfer everything to a separate container before adding my lye solution. This wonderful & handy pot makes that a thing of the past now & saves me from doing extra dishes (ALWAYS a plus!!). I do everything in this one pot now, and the time it saves me, plus ease of use is AWESOME! No more crock pot... Just one pot to rule them all! I'm loving how affordable this was, plus it's incredibly well-made/durable, and the handle (extremely durable as well), is perfectly positioned for ease of use! It's designed for pouring too, so once everything is blended to trace & ready to go, it tranfers beautifully & easily to my mold! I also love how the measurements are etched on the inside of the pot, so I can clearly see how much soap batter I have, which makes dividing batter up evenly to make different colors a breeze now! No more taking a Sharpie marker to the outside of my old plastic jug & "eyeballing" it! Lol! In SO MANY ways, this has definitely become one of the best investments I've made when it comes to soaping equipment! I am so incredibly happy with this product and its many many uses!! Thank you, thank you, thank you WSP!!!! • So many uses! Saves time & clean-up. • Awesome features & extremely durable! • Not a thing! I'm SO HAPPY with this pot! "Can this be used on a gas stove?" Staff Answer These pots are made of stainless steel and can be used on a gas stove. "Is this a “true” stainless steel container that would be safe to mix lye in? I just purchased a stainless steel container from a very reputable (non-soaping) company, put it in the dishwasher once before using it and it came out of the dishwasher with small rust spots on the interior. I returned it immediately and haven’t been able to find a reliable source for something to mix my lye water in yet. " Staff Answer Yes, this is a true stainless steel pot. Our customers are just loving this new product! "can i use this melt soy wax or beeswax to make wax melts or candles? is it hard to clean the wax after use?" Staff Answer Yes, you can use this for beeswax or soy wax. To clean, very carefully wipe it with a paper towel while the wax is still liquid and then wash with soap and water. "Will this work on an induction countertop "hot plate"? A magnet will stick to the bottom of this pot if it's induction ready. Thank you! " Staff Answer Yes, these can be used on an induction type of hot plate. Melting oils/butters in 8-Cup Stainless Steel Pot!